Researchers at Northeastern University and the University of California, Irvine say that scientists might soon have evidence for extra dimensions and other exotic predictions of string theory. Early results from a neutrino detector at the South Pole, called AMANDA, show that ghostlike particles from space could serve as probes to a world beyond our familiar three dimensions, the research team says. No more than a dozen high-energy neutrinos have been detected so far. However, the current detection rate and energy range indicate that AMANDA's larger successor, called IceCube, now under construction, could provide the first evidence for string theory and other theories that attempt to build upon our current understanding of the universe. An article describing this work appears in the current issue of Physical Review Letters. The authors are: Luis Anchordoqui, associate research scientist in the Physics Department at Northeastern University; Haim Goldberg, professor in the Physics Department at Northeastern University; and Jonathan Feng, associate professor in the Department of Physics and Astronomy at University of California, Irvine. 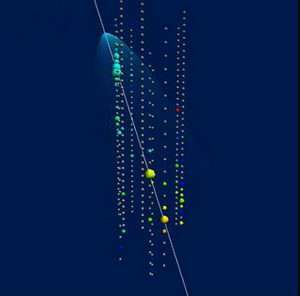 The evidence, they say, would come from how neutrinos interact with other forms of matter on Earth. In recent decades, new theories have developed – such as string theory, extra dimensions and supersymmetry – to bridge the gap between the two most successful theories of the 20th century, general relativity and quantum mechanics. Quantum mechanics describes three of the fundamental forces of nature: electromagnetism, strong forces (binding atomic nuclei) and weak forces (seen in radioactivity). It is, however, incompatible with Einstein's general relativity, the leading description of the fourth force, gravity. Scientists hope to find one unified theory to provide a quantum description of all four forces. Clues to unification, scientists say, lie at extreme energies. On Earth, human-made particle accelerators have already produced energies at which electromagnetic forces and weak forces are indistinguishable. Scientists have ideas about how the next generation of accelerators will reveal that strong forces are indistinguishable from the weak and electromagnetic at yet higher energies. Yet to probe deeper to see gravity's connection to the other three forces, still higher energies are needed. Anchordoqui and his colleagues say that extragalactic sources can serve as the ultimate cosmic accelerator, and that neutrinos from these sources smacking into protons can release energies in the realm where the first clues to string theory could be revealed. Neutrinos are elementary particles similar to electrons, but they are far less massive, have neutral charge, and hardly interact with matter. They are among the most abundant particles in the universe; untold billions pass through our bodies every second. Most of the neutrinos reaching Earth are lower-energy particles from the sun. AMANDA, funded by the National Science Foundation, attempts to detect neutrinos raining down from above but also coming "up" through the Earth. Neutrinos are so weakly interacting that some can pass through the entire Earth unscathed. The total number of "down" and "up" neutrinos is uncertain; however, barring exotic effects, the relative detection rates are well known. AMANDA detectors are positioned deep in the Antarctic ice. 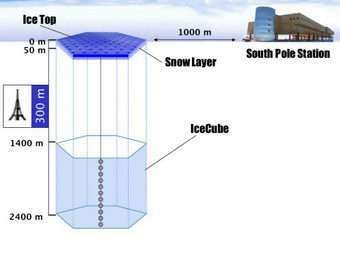 The NSF-funded IceCube has a similar design, only it has about six times more detectors covering a volume of one cubic kilometer. A neutrino smashing into atoms in the ice will emit a brief, telltale blue light; and using the detectors, scientists can determine the direction where the neutrino came from and its energy. The key to the work presented here is that the scientists are comparing “down” to “up” detections and looking for discrepancies in the detection rate, evidence of an exotic effect predicted by new theories.